Home Chief Justice Kalabagh Dam guarantees survival of Pakistan: CJP Nisar. 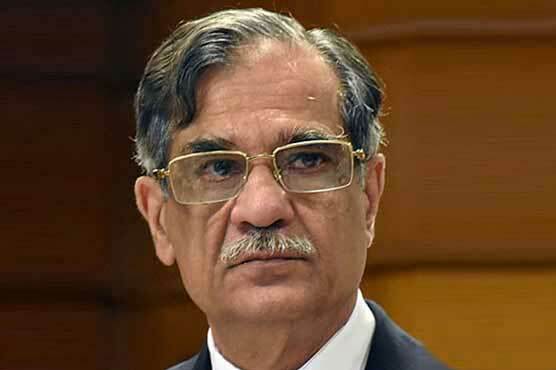 LAHORE: Chief Justice of Pakistan Justice Saqib Nisar Saturday said that only Kalabagh Dam guarantees the survival and security of Pakistan. The chief justice said so while addressing a ceremony in Lahore, organised by a welfare organisation that provides interest-free loans to poor and needy people. He said that there was going to be an immense shortage of water in the days to come, adding that if a consensus was reached by the nation then Kalabagh Dam would also be constructed. "The construction of dams is the only solution to the water crisis," Justice Nisar said. "I came to know of a water crisis in Quetta. The issue can take such a serious turn that the people may have to migrate." He said that they had not stopped pursuing the matter of Kalabagh Dam's construction. "If the nation agreed then we will also make Kalabagh Dam after the construction of Diamer-Bhasha and Mohmand dams," the chief justice said. "Only Kalabagh Dam guarantees survival and security of Pakistan." He noted that the transgender community donated Rs100,000 for dam fund. "I announce Rs100,000 for [those] transgender people. "You all are protectors, you have to stand guard so that the dam projects could be completed," Justice Nisar said. Earlier today, Justice Nisar warned that any person who attempts to hinder the construction of dams will be tried under Article 6 of the Constitution. He said so while hearing heard a suo moto case of mineral water companies using underground water for selling it in bottles at the Supreme Court’s Lahore Registry.